My Life in Stills and Syntax: Let's Get Physical! Normally on Sunday's I don't find myself opening my eyes until the crack of noon, let alone actually rendering myself vertical. However this Sunday when the clock struck 5:30am I found myself tying on my running shoes. 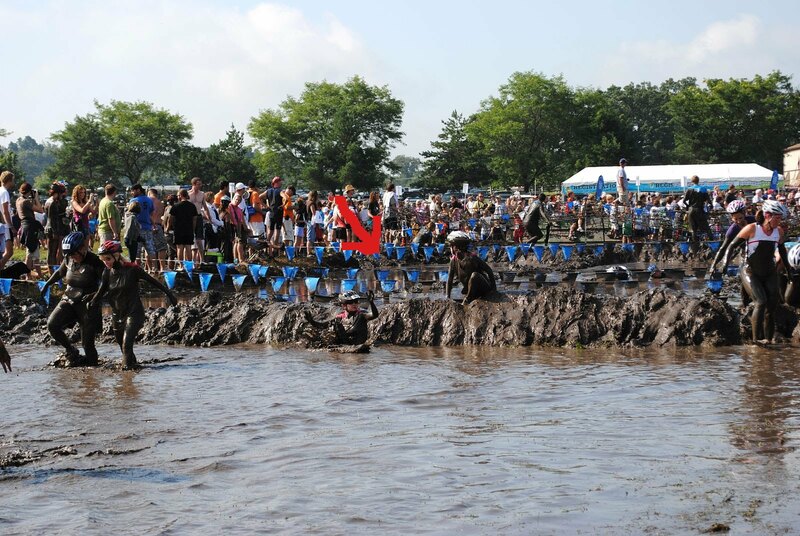 This weekend was spent in Chicago to participate in the 2010 Chicago Muddy Buddy with The Gray Lining. 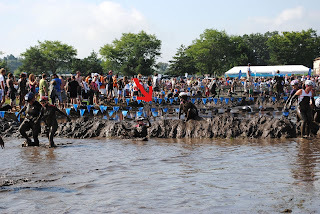 This was my 2nd go at the Muddy Buddy, my first being with My BMF a year ago in Orlando. I can now say with confidence that the Muddy Buddy Chicago makes the Orlando look like a stroll on the beach. Several months ago the Gray Lining put up a Google share calendar so we could track our training progress and I have to say I was pretty diligent about getting several miles in 3-4 times a week. I know that isn't top physical form but for a lady of leisure like myself I was as pleased as punch. Even though I was in much better shape than this time last year I don't think there is possibly a way I could have trained to run a race in the Midwest, while living in south Florida. See, in the Midwest there are these things called hills. We don't possess those. Well, let me take that back, I know of one hill. I see it when I'm driving to work everyday. So I guess the only possible way I could have prepared myself for the hell that was the Muddy Buddy Chicago was to go out to our hill and run up and down it repetitively. The race started off well, me on the bike and The Gray Lining running. I was feeling pretty good and passing people like it was my job, confident that my mountain biking skills were far superior to those around me as I saw the rough terrain cause a couple wrecks. All in all about about a half mile into the race I thought "Two Girls One Bike" were going to make this Muddy Buddy their biotch. About a quarter mile left in my initial biking leg I came upon a mud pit, about 8 feet wide and 12 feet long. 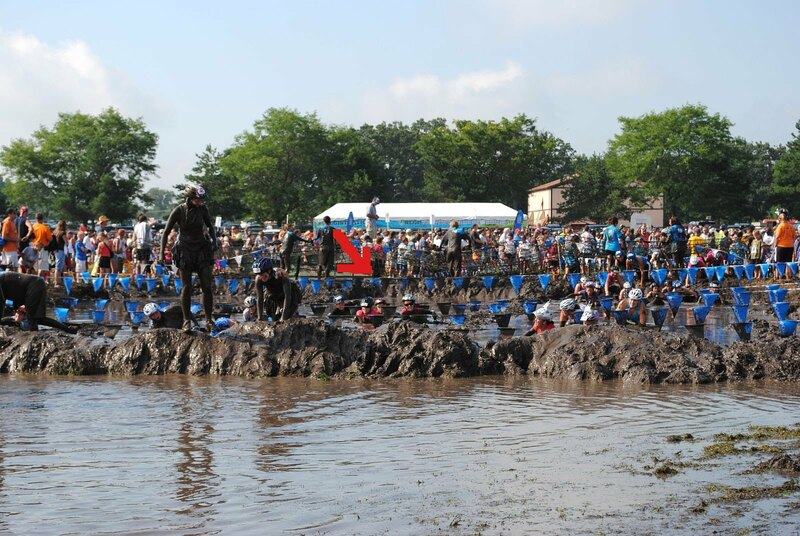 Race volunteers instructed the bikers to carry their bikes through the pit which left me about ankle deep in mud and about knee deep in water. While focusing on not falling the thought that I had to finish the remainder of the 5 miles with shoes weighed down by mud and water didn't even enter my mind. Don't worry, that thought quickly made its way into my consciousness as I dumped my bike off at the first obstacle and started on my mile run. After that it was Bike, Run, and Bike again with a few wall climbs and army crawls tossed in between before I met up with The Gray Lining to finish out the last quarter mile of the race. What happened next is etched in my brain and as it turns out etched in my flesh. Once again the race volunteers instructed us to pick up our bicycles and to hop into what can only be described as a ditch filled with water run off from a horse/cow pasture. Imagine that lovely smell. All was well until I went from knee deep in the poo water to thigh deep in the poo water. Apparently the ditch came complete with what seemed to be underwater pot holes. With the weight of the bike on my back and no available hands to use to stop my forward momentum my shins bared the brunt of my entire weight + the weight of our 1994 10 ten speed as they smacked into the concrete edge of the underwater pot hole. Thankfully some other racer pulled the bike off me, as The Gray Lining continued for the finish. After realizing amid my screams that I was injured The Gray Lining came back to assist with the bicycle while I hobbled through the remainder of the ditch bleeding, battered, and covered in poo water. 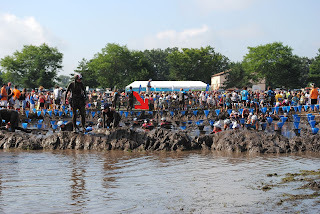 As with any Muddy Buddy the race finished with a crawl through a mud pit and a run to the finish. It wasn't pretty and it certainly wasn't graceful, but we completed the race in 1 hour and 9 minutes. Overall, I will call it a success and only had one request for next year...that The Gray Lining and I compete on flat land next year in the Sunshine State.